Individuals are sponsored for a variety of reasons and in many different ways. This sponsorship agreement has been drawn to be flexible and to cover many sponsorship situations without being difficult to complete. A large part of the agreement covers the substance of the deal: what the sponsor will provide in return for the agreed obligations of the person being sponsored. We provide a range of examples to which you can add, edit or delete as appropriate. The agreement also includes further legal paragraphs not usually included in such documents that protect both sides in case of later disagreement or non-fulfilment. These can also be edited to your requirements. The agreement is governed by the laws of South Africa, but the location of either party could be elsewhere. 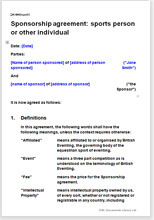 The agreement could, for example, be used by a South African company to sponsor a British sportsman. This agreement will suit a large number of sponsorship arrangements. the sponsored person could be operating at any level, from amateur to international professional. The agreement includes the following paragraphs as well as other standard legals.